I normally blog to get people to donate to kid’s charities but not today. I wanted to write about remembrance today. Today is Remembrance Sunday, the day when Britain and many Commonwealth countries commemorate those who died during conflicts since World War One, both armed forces and civilians. It is right to remember those who lost their lives during conflict. Even if you don’t agree with the policy that brings a conflict about those who serve should be honoured. They risk life and health on the behalf of others. I don’t like conflict, I suppose that is fairly obvious to those who read this blog. However, I am not naive enough to think that there should never be wars. I abhor it but war can be necessary and today is the day to remember those who are no longer with us. Blogging is a personal thing and I wanted to write about my strongest memory of Remembrance. I have been to the Somme battlefields. Six of us planned a two day visit some years ago before a trip to Paris to watch Ireland play France at the rugby. It may seem a bit incongruous to mention rugby in this post but please be patient. We started off in Albert and the Somme Museum in the underground tunnels. They have equipment, uniforms, letters from the ‘Great War’. I was struck by how small the boots were and the narrow shoulders of the jackets; some seemed more like childrens clothing than those belonging to grown men. We then drove through beautiful countryside to visit the memorial sites. I will write about a few places that have stayed with me. Firstly, The Newfoundland Memorial of Beaumont-Hamel. This is an amazing place which commemorates the participation of the Newfoundland Regiment during the Battle of the Somme. They have preserved the trench system so that visitors can get some impression of how it was at the time. I was surprised they were so shallow and it seemed to me that they would not have provided much shelter or protection but they were all those poor boys had. The first day of the battle, July 1st, 1916, saw the Newfoundlanders decimated, over three quarters of the regiment were killed or wounded, only 68 men survived unscathed. Within the site there stands a great bronze caribou stag, the emblem of the Newfoundland Regiment. The vistors centre traces the history of the Royal Newfoundland Regiment from its formation in 1914 to the end of the First World War. When you walk through this centre and read the stories of some of the men and their families you cannot help but feel moved…. 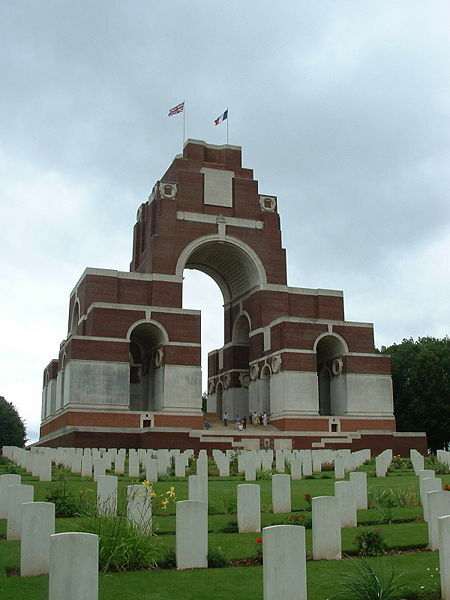 We also visited the Thiepval Memorial. This site commemorates almost 73,000 soldiers who lost their lives and have no known grave. The Memorial itself is striking, as you make your way towards it you are struck by the scale of the structure. You then walk slowly around the memorial reading name after name of those who have no recognised grave. What stays with me was the sense of peace I found here. It was quiet, the only sound I heard as I walked around the gravestones was one bird singing far off in the distance. I had felt some trepidation about visiting the Somme battlefields and memorials, I was certain that I would find it oppressive. However, the opposite was true. I felt truly honoured to be there and was glad that I had the chance to pay my respects to those who had fallen. We visited many other sites during our visit. You may find this strange but I found it heartwarming to see the small graveyards that you pass as you travel through the countryside. We stopped at some of the smaller sites that do not have large memorials as it felt right to honour those who lie there. They are all beautifully maintained and this is fitting.